A former neighbor, Frederic, recommended a rooftop restaurant in Prague. I discovered, quite by accident as I was wandering one evening, the hotel where the restaurant was located was quite close to my apartment. Knowing Frederic’s exquisite taste, I decided to have my last dinner there, because I knew it would not disappoint. Except, that it was closed because of the cold weather. Sigh. The concierge recommended I try a restaurant, Terasa, in their sister hotel not too far away. I walked through the winding streets, sure I was lost, then came upon the hotel. I took the lift to the top floor, then climbed a narrow staircase to the small restaurant. The maitre d’ greeted me. He laughed too. “One moment, ma’am.” He left and came back a few moments later. 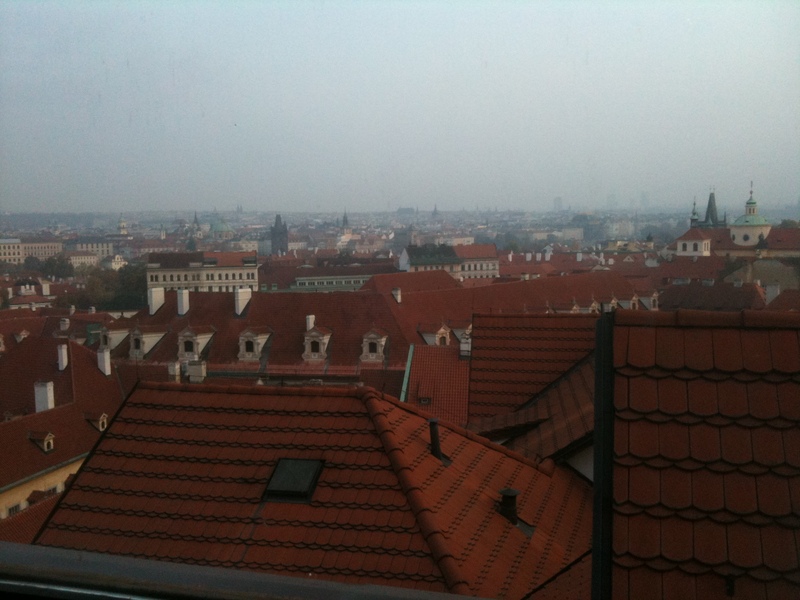 He escorted me to a table for two to a window overlooking what seemed to be all the rooftops of Prague. He took my coat and pulled out the chair for me. After I sat down, he lit a candle on the table. Being the only person in the restaurant, I felt like a queen. As I perused the menu, I realized that no matter what I ordered, it would be delicious. After two plus weeks of eating heavy meat dishes, I was ecstatic to see several seafood dishes on the menu. 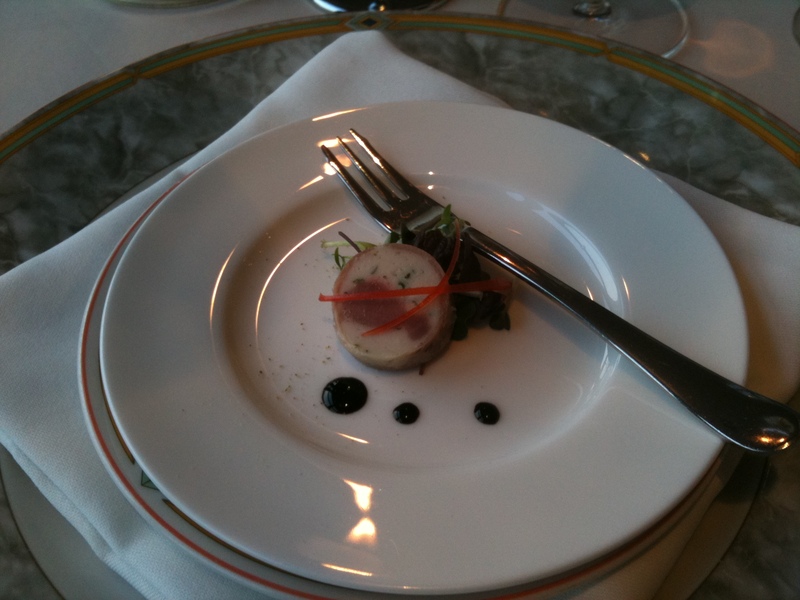 After I ordered, he returned with an amuse-bouche of salmon terrine. I love the concept of amuse-bouche. I’ve never taken French, so I don’t know the direct translation, but in my mind it means, “A little kiss of food. Just for you.” It’s always a surprise when it arrives and I’ve never been disappointed by what the chef offers. 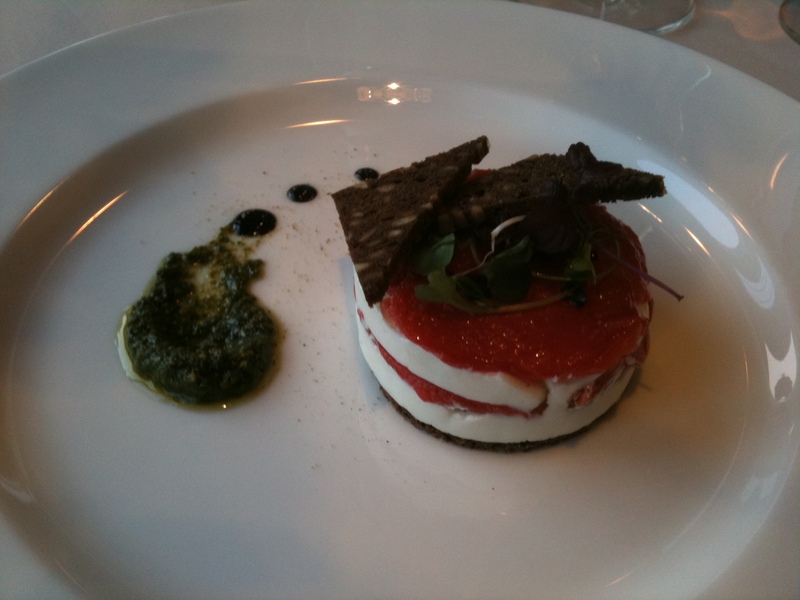 The first course was a goat cheese and sun-dried tomato mille feuille. When I saw it on the menu, I liked all the ingredients, but, have never taken French, was not sure how to pronounce it. “I’ll have the mmmmm….” I said, pointing at the menu. “Ah, the mille feuille. An excellent choice,” rolled off the waiter’s tongue. And I wasn’t disappointed. It came, a plate of creamy seafood with a light garlic sauce surrounding it. 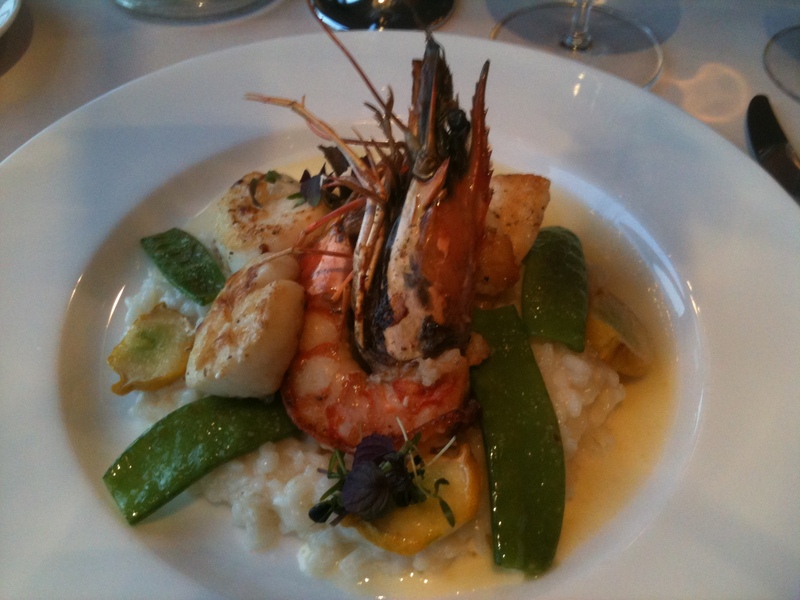 Grilled John Dory, a huge tiger prawn, a few tender scallops, crisp snow peas, and grilled baby squash sat upon the clouds of risotto. At this point, I was watching the sun set and the lights start to flicker on in the town. I was thinking about how my vacation couldn’t have been any better. For five days, I had been surrounded by beautiful music. I had eaten delicious local cuisine. I had been surrounded by beautiful design, almost everywhere I went. I had ridden a train through Hungary, Slovakia, and the Czech Republic. I was feeling very lucky, and very grateful. And then he offered me the dessert menu. I guess sometimes life can get better. I asked him what his favorite dessert was. He grinned, then said the creme brulee sampler. Creme brulee? My favorite dessert of all time? 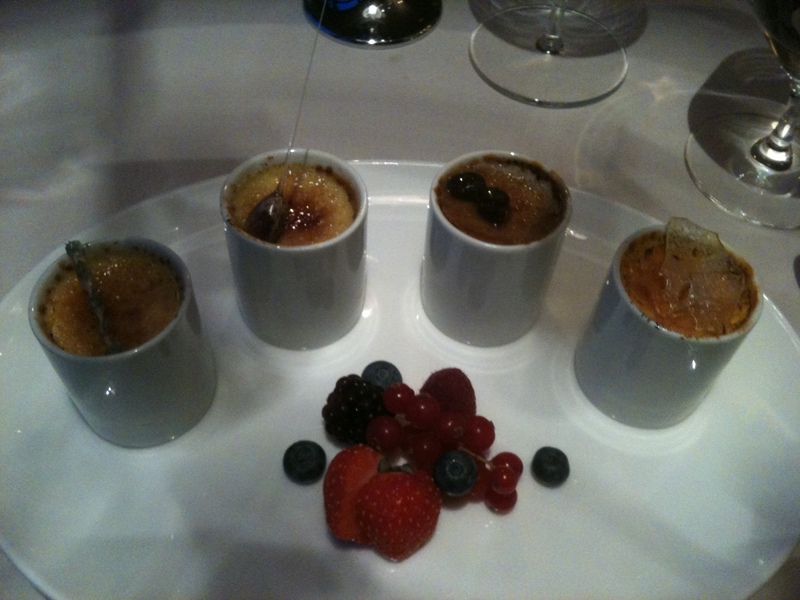 Four individual ramekins of deliciousness, all different flavors? Yes, please. The creme brulee was perfect. Tiny ramekins, a couple of bites each, of deliciously flavored sweetness – lemon-thyme, pistachio, coffee bean, and saffron. Somewhat to my surprise, the saffron was my favorite. The savoriness of the saffron contrasted nicely with the sweetness of the creme. And that was my last supper in Prague. A perfect way to end a perfect vacation. Hi Lori. Bouche means mouth, so an amuse bouche is something that whets the appetite, “pleases the mouth”, usually combining taste and texture in that pleasure, not to mention visual appeal. It sounds like you’re following your own advice and living life a little everyday! We write about food a lot and the tiger prawns “on top” of creme brulee in your photo made me think of this photo: http://raxacollective.wordpress.com/2011/10/07/crunch/ ! Strange connection surely! Thank you for your wonderful Prague reports. Now i REALLY want to go. Everyone sez the city is wonderful & given my slovak/slavic heritage, i cannot think of any reason to put off visiting. We met some wonderful women i know you know (Rachael and Emily) at the Seattle Room to Read event — they say hi. Be sure to read the Kristof column in the Nov 5th NY Times. I must say that I am quite jealous, you’ve seen places that I only wish to travel to some day. I love the photos. I can only imagine the look on your face when you found out about the ‘one more flight’ to go. One day I do plan to visit places such as Prague …I don’t know how soon or how late in my life that will be, but I do plan to get there at least once before I leave this planet. The most traveling I’ve done has been to the West Coast of the United States.